Delmar, DE — (June 2, 2014) — If you have never seen a non-wing sprint car race, you don’t know what you’re missing. 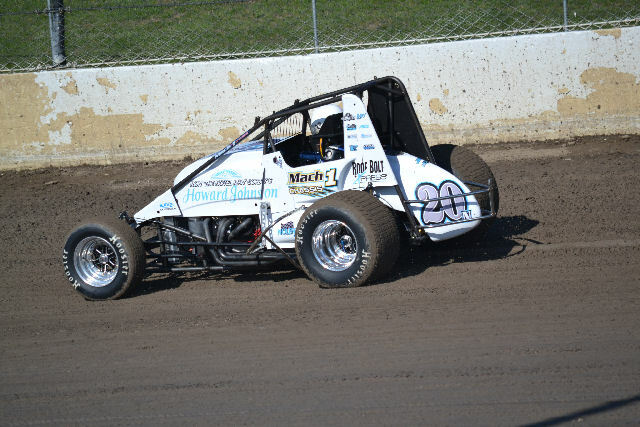 So plan to be at the Grandview Speedway Tuesday night, June 3 when the NAPA Auto Parts Thunder on the Hill Racing Series continues with the Jesse Hockett Classic for the USAC non-wing sprint cars and ARDC non-wing midgets presented by Window World. Race time is 7:30 PM. The nation’s best non-wing sprint car drivers from around the county will gather on the “hill” Tuesday night. Drivers like Jarrett Andretti of Indianapolis, IN, Shane Cottle of Kokomo, IN, the “ Modern Day Cowboy” Daron Clayton of Sikeston, MO, Dave Darland, Lincoln, IN, Tracy Hines of New Castle, IN, Kevin Thomas, Jr. of Cullman, AL, Robert Ballou of Rocklin, CA, Nathan Moore of Tyler, TX, Chad Boespflug of Hanford, CA and Brady Bacon of Broken Arrow, OK are some of the expected entries. Look for ARDC defending champion Trevor Kobylarz of Birdsboro, PA to make his initial non-wing sprint car outing at Grandview and some other locals to include Billy Pauch Jr and Central PA driver Mark Smith. Non-wing sprint car racing is not for the “faint of heart”. This is as extreme as dirt track racing gets. In many forms of racing, time trials can be a yawner, but not when the USAC cars take to Grandview Speedway. Some say, USAC time trials along are worth the price of admission. Well, have no fear, there is much more to the show then just time trials. These non-wing sprint car drivers use the outside boiler-plate as a way to slow down. There is always wheel rubbing, countless slide-jobs and racing in a pack is just the norm. In the 2013 running of the Jesse Hockett Classic, Daron Clayton did it all to win the $6,000 first place prize. In a three car battle for the win, Clayton, Levi Jones and Bryan Clauson were on the inside berm, glazing the boiler-plate and offered a three car battle for the lead for the final fifteen laps. Daron Clayton may have failed trying to move the outside boiler-plate at Grandview, but he did win the prestigious event. Gates will open at 5 PM and for advance ticket holders, you may enter the grandstands at 4:30 PM. Warm-ups will begin at 6:45 with time trials getting underway at 7:30 PM. USAC time trials, heat races and the 40 lap Jesse Hockett Classic are on the program along with the ARDC non-wing midgets, competing in a series of heat races all leading up to a 25 lap feature event. On May 25 at Grandview, ARDC put on the best show of the night, with Alex Bright taking the win in the non-stop 25 lap feature with Bright starting twenty-first. . . It was an awesome race! The popular pre-race pit tours introduced at the May 25 Thunder on the Hill event will be offered on Tuesday night as well as the Inside/Out Promotion where fans may watch the warm-ups from inside turn four. What a treat with USAC on the hill. And don’t forget to welcome our newest sponsor, Window World, America’s largest home improvement company. Window World of Lehigh Valley is your local specialist to help you with your window, vinyl siding, entry door or patio door needs. They can be reached at 610-432-6878, online at www.WindowWorldAllentown.com or at their show room 5925 Tilghman St, Allentown, PA 18104. Following Grandview, the AMSOIL USAC Eastern Swing will include stops at the Lincoln Speedway Wednesday, June 4, New Egypt Speedway, Thursday, June 5, Port Royal on Saturday, June 7 with the finale set for Sunday, June 8 at the Susquehanna Speedway. Adult Admission: $25 Children 6-11 $10, five and under Free Pits $35 No license required.